When Coast Packing Company’s ’69 ProCharger Pro Mod Camaro queues up for a run, you best not blink. During testing at Bradenton Motorsports Park in Florida on Wednesday, the modified Chevy matched the world record for the quickest centrifugal supercharger-powered door car, with a 3.67 elapsed time at 200.98 mph. This go-round, Pro Stock legend Larry Morgan was behind the wheel, spelling Coast Packing CEO Eric R. “Goose” Gustafson, who previously recorded a 3.755@200 mph at the Atlanta Dragway last April – then the quickest centrifugal supercharged Pro Charger-equipped door car in 1/8th mile drag racing. As always, Jason Lee of PTP Racing handles the tuning with a Haltech Elite 2500. 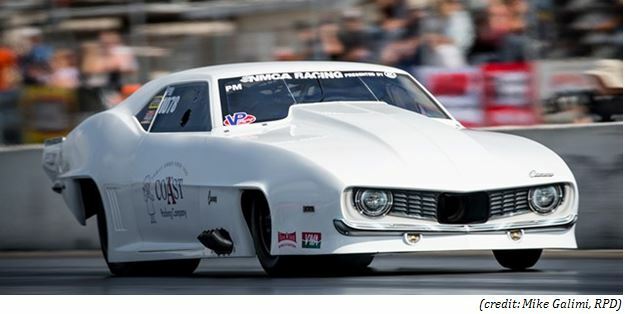 Improvements on the 2570-pound racecar for the 2019 race season include chassis updates, refinements and weight reduction by Tim Lyons at Lyon Custom Motorsports, with a Noonan Engineering 4.800 bore space 526 cubic-inch Hemi providing the power.